Tag line: "The story of that man and his 76 trombones, and the wonderful, wonderful tune he played on every heart in town!" Back in 1983, my father bought our family’s very first VCR, and within two months of its arrival, I’d already amassed a pretty impressive collection of movies, TV shows and music videos, spread across approximately 30 six-hour video tapes. My father and brother, though well behind the pace I was setting, were working on collections of their own, whereas my mother (a master of frugality) had exactly one tape to her name. To this day, I can remember its contents: 4 half-hour episodes of a local morning exercise program and the 1962 film version of The Music Man. I have to admit that, even though I had plenty of my own stuff to enjoy, I'd occasionally pop this tape into the machine simply to watch this very entertaining musical/comedy. Based on Meredith Wilson’s 1957 Broadway sensation, The Music Man is the story of Professor Harold Hill (Robert Preston), a con man who travels across the Midwest convincing gullible citizens of small-town America that their community is in dire need of a boy's band. A master pitchman, Hill talks the unsuspecting rubes into turning over as much cash as they can muster for uniforms and instruments, then hops the next train out of town, never to be seen or heard from again. When Hill lands in River City, Iowa, however, he finds much more than he initially bargained for. After successfully sweet-talking the local music teacher (Shirley Jones) into believing he’s on the level, Hill finds himself falling head over heels in love with her. To further complicate matters, this music teacher has a younger brother (Ron Howard) eager to join Hill’s band, the first time the youngster has shown an interest in anything since the death of their father. In deeper than he’s ever been before, Hill faces a tough decision; will he once again skip town, or stay and do what he’s never done before; organize an honest-to-goodness boy’s band? Robert Preston, who'd spent years playing Harold Hill on Broadway, was considered too old to reprise the role for the film, and a search for a “new” Harold Hill was launched. Supposedly, when the producers asked Cary Grant if he'd be interested in the part, Grant replied, “I’ve seen Robert Preston in the role on Broadway, and no one can play Harold Hill better than him”. As it turns out, old Cary was 100% correct. Robert Preston is flawless as Hill, bringing a natural energy to The Music Man that never eases. There are moments scattered throughout when The Music Man feels like a one-man show, such as the lively rendition of “You Got Trouble”. In it, Preston hops around from start to finish as if his shoes were on fire, the lyrics of this delightful tune springing from his lips with stunning rapidity. I was only 13 years old when I first saw The Music Man, a time in my life when I was expressing no interest whatsoever in the musical genre. I'd seen The Wizard of Oz, of course, but that film was so much more than the sum of its musical sequences, and childhood staples such as The Sound of Music were but a distant memory. 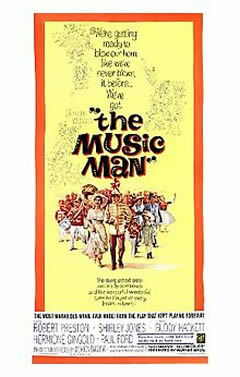 The Music Man changed all that, and started me down the diverse and fascinating road of the Hollywood musical. I'm happy to report that, even today, with many more musicals under my belt, The Music Man remains a benchmark, and believe me when I tell you, it’s one hell of an act to follow.